When Hyatt Says Award Rooms Aren’t Available, There’s Still Hope! I’ve had several situations with Hyatt where the hotel had lots of paid rooms available but no award rooms. How can I get an award night? Do You Know How to Get an Award Night When a Hyatt Hotel Like the Park Hyatt New York Shows No Award Nights Are Available? Here’s how Jasmin can book a room using Hyatt points even when the website shows NO award nights are available! 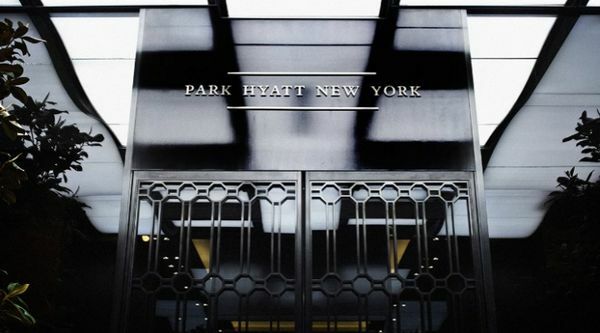 Jasmin wants to book an award night at the Park Hyatt New York on May 23, 2015, for Memorial Day weekend. But the Hyatt website shows no rooms (using Hyatt points) are available. But cash rooms are available at the Hyatt Daily Rate. Why does the hotel I want to go to have rooms available, but I am being told that I can’t redeem my Hyatt Gold Passport points? Hyatt Gold Passport award allotment is limited contractually and is subject to availability. When a hotel’s award allotment is filled, the hotel is no longer required to offer free nights using points. Hyatt Gold Passport Free Night Awards apply when standard rooms are available at the Hyatt Daily Rate. Standard rooms are defined by each hotel and are not subject to blackout dates. This means a room can be booked using Hyatt points. So there’s still hope for Jasmin! Jasmin should call Hyatt at 888-228-3360 and ask to book a room using Hyatt points. 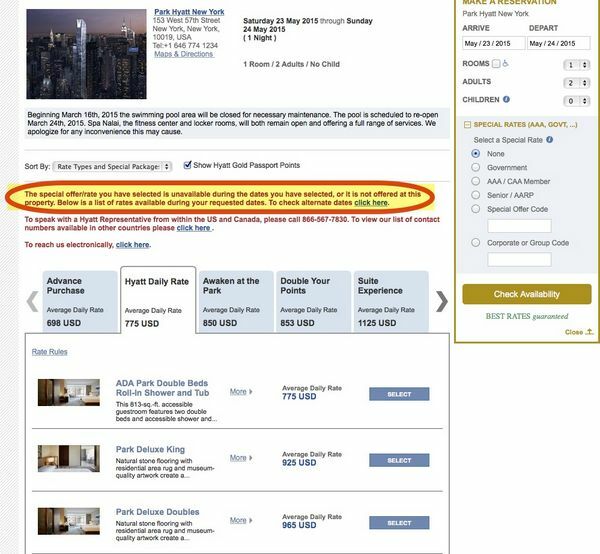 If the agent says no rooms are available, Jasmin should politely state that Hyatt doesn’t have blackout dates and refer to the terms and conditions. 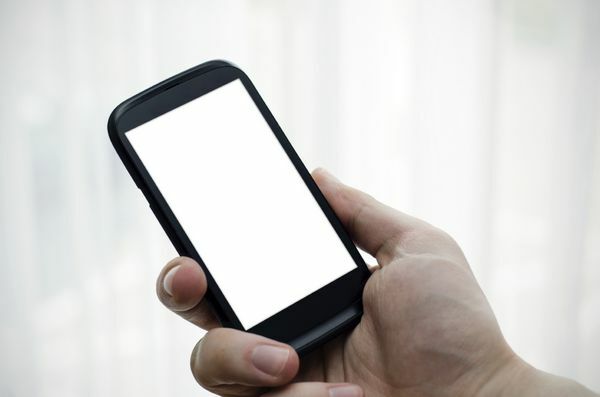 If the 1st agent can’t or won’t help Jasmin, she should hang up and call again. If the 2nd agent won’t help, Jasmin should nicely ask to talk to a supervisor. Because the terms are very clear and there are standard rooms available, Jasmin should be able to book an award night at the Park Hyatt New York on May 23, 2015. Or any date that shows standard rooms for sale! Nick from The Points Guy did this to book an award night at the Park Hyatt Paris-Vendome. And a poster on this thread on Flyertalk was also able to book an award night with help from the Hyatt Concierge. The Hyatt hotel Jasmin wants to book does NOT show available award nights. But the hotel DOES list standard rooms available for cash. However, Jasmin should be able to book the standard room with points, even though the site says she’s can’t! That’s because Hyatt has a no “blackout dates” policy. And the Hyatt Gold Passport terms and conditions state if a hotel has standard rooms available, you can book it with Hyatt points. So Jasmin can call Hyatt at 888-228-3360 and nicely ask to book a room using Hyatt points. Good luck, Jasmin. Let me know if it worked for you! I did this today for the all-inclusive Hyatt Zilara Cancun over New Years Eve. I was honestly a bit surprised that the representative readily did it no questions asked. I was ready for a debate over the terms, but no issue at all – even over NYE! I consider 25k points per night all-inclusive to be a steal, when the average daily rate for our stay is just over $1,500/night. Thank you for this thread. I was trying to book 2 nights at Hyatt Centric Fishermans Wharf in SF later this month. The Hyatt website showed availability for “Standard Rate Room”. I moved some points from my account to my wifes account to get us to 15,000 points to use for one night and a Hyatt anniversary night for the other. When I called to make the reservation they tried to tell me that the available nights are not “standard rooms” and therefore I could not use my points or anniversary night towards them. They tried to claim that the Standard Rate on the website I saw seeing was for a courtyard view whereas the standard rooms that are eligible for rewards don’t have a view at all (or probably of a brick wall). I called BS on this and asked to talk to a supervisor. He said he would call the hotel and see what he could do. I imagine he was inquiring as to whether the hotel thinks they would sell the room otherwise being that it is only a couple of weeks away. He came back and said he could let me use my anniversary night and my points toward the room. I was about to give up and pay cash or some other points and stay elsewhere but MMS saved the day. Love your site, I check it daily! I’m trying to book Park Hyatt in Paris using my two free award nights from the credit card but they told me the standard rooms are not available. However, I can see it’s available for cash from the Hyatt website. Can I still call and tell them that it should be available? I’ve made reservations at Park Hyatt Sydney from 28th Dec – 30th Dec however, when i try to book 31st Dec(new years eve), Hyatt website says the hotel is sold out for that night. I called up Hyatt reservations and they directed me to the manager at the actual property (Park Hyatt Sydney). This manager told me that standard rooms are available but i will have to take a 5 day package with $2000 rate per night. I don’t want to pay $2000 per night for 5 nights since i already have 3 days booked. Do you have any ideas on how i should approach this? The standard rooms are available but its not showing up on the website.